Another meta-analysis of existing studies in which patients were discontinued from antidepressants and found to "relapse" -- except that this paper admits "discontinuation studies vary widely in the criteria that are used to define a relapse.....Prior meta-analyses have not attempted to control for the variability in the stringency of relapse criteria in discontinuation studies, possibly because it is difficult to objectively compare relapses defined by different instruments." This paper supports Giovanni Fava's theory of oppositional tolerance -- that the brain compensates for the action of antidepressants and attempts to recover normal equilibrium among neurotransmitters. While G. Fava et al 2010 and El-Mallakh et al 2011 suggest antidepressants overpower the brain's natural inclination to homeostasis, Andrews et al take the view of evolutionary psychiatry: The brain adapts and re-adapts, maintaining homeostasis as it was intended to do. In this paper, the disruption of normal functioning by antidepressants is called "perturbational effects." Unusually readable for a scientific paper, it is more than 50 pages long. Front. Psychology 2:159. 2011 June. Abstract at http://www.frontiersin.org/evolutionary_psychology/10.3389/fpsyg.2011.00159/abstract Free full text here. Some evolutionary researchers have argued that current diagnostic criteria for major depressive disorder (MDD) may not accurately distinguish true instances of disorder from a normal, adaptive stress response. According to disorder advocates, neurochemicals like the monoamine neurotransmitters (serotonin, norepinephrine, and dopamine) are dysregulated in major depression. Monoamines are normally under homeostatic control, so the monoamine disorder hypothesis implies a breakdown in homeostatic mechanisms. In contrast, adaptationist hypotheses propose that homeostatic mechanisms are properly functioning in most patients meeting current criteria for MDD. If the homeostatic mechanisms regulating monoamines are functioning properly in these patients, then oppositional tolerance should develop with prolonged antidepressant medication (ADM) therapy. Oppositional tolerance refers to the forces that develop when a homeostatic mechanism has been subject to prolonged pharmacological perturbation that attempt to bring the system back to equilibrium. When pharmacological intervention is discontinued, the oppositional forces cause monoamine levels to overshoot their equilibrium levels. Since depressive symptoms are under monoaminergic control, this overshoot should cause a resurgence of depressive symptoms that is proportional to the perturbational effect of the ADM. We test this prediction by conducting a meta-analysis of ADM discontinuation studies. We find that the risk of relapse after ADM discontinuation is positively associated with the degree to which ADMs enhance serotonin and norepinephrine in prefrontal cortex, after controlling for covariates. The results are consistent with oppositional tolerance, and provide no evidence of malfunction in the monoaminergic regulatory mechanisms in patients meeting current diagnostic criteria for MDD. We discuss the evolutionary and clinical implications of our findings. Table 1. Perturbational effects of antidepressants on mPFC levels of monoamine neurotransmitters (expressed as percent over baseline). Two types of studies are relevant to these predictions. In ADM extension studies, patients diagnosed with MDD are initially randomly assigned to ADM or placebo during the treatment phase, and then remitters in both groups are followed in an extension phase in which they continue to receive the same treatment. Since our first prediction relates to the risk of relapse after remission without ADM treatment, we only consider the Placebo-Placebo arms of extension studies. We put placebo in its own class (PBO) and assign to placebo treatment a perturbational score of 100 (no effect on baseline levels) for each of the monoamines. We found robust support for our predictions. The risk of relapse after ADM discontinuation was higher than the risk of relapse after remission on placebo. Moreover, the risk of relapse was after ADM discontinuation was positively predicted by the degree to which ADMs perturbed 5-HT and NE levels in the rodent mPFC. The risk of relapse was also positively predicted by the degree to which ADMs perturbed DA levels in the mPFC. Given the high degree of collinearity between the perturbational effects of ADMs on NE and DA, we prefer the 5-HT/NE model over the 5-HT/DA model because the evidence for the involvement of NE in depression is stronger. While the results are robust, their implications depend on their interpretation, so we first discuss several potential confounds. Is it possible, for instance, that the results do not reflect the risk of relapse, but rather withdrawal symptoms? The discontinuation of antidepressant medication can cause withdrawal symptoms (also known as discontinuation syndrome) that are unrelated to relapse, but may sometimes be mistaken for relapse (Haddad, 1997). Such mistakes are more likely with untrained physicians (Haddad, 1997), so it should be less of a problem in ADM discontinuation studies where trained psychiatrists are employed to evaluate putative cases of relapse. Regardless, drugs with longer half-lives are less likely to show discontinuation syndrome (Fava, 2006; Michelson et al., 2000). If discontinuation syndrome were being mistaken for relapse, then drugs with longer half-lives should have lower relapse rates. To test this possibility, we added half-life to the best-fitting model and eliminated the perturbational variables (results not shown). The resultant model did not fit as well, and, in fact, half-life was a significant positive predictor of relapse rate. This is because drugs with stronger perturbational effects on 5-HT tend to have longer half-lives. We therefore have no evidence that withdrawal symptoms were mislabeled as relapses. 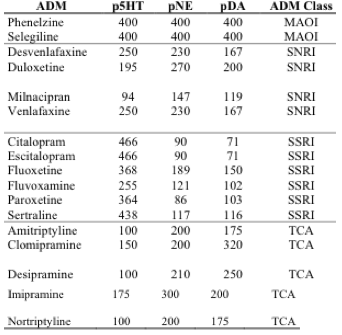 There is some evidence that ADM treatment resistant patients may have higher relapse rates (Rush et al., 2006). Is it possible that studies using ADMs with stronger perturbational properties had higher relapse rates, not due to the pharmacological properties of the drugs used, but because they also had higher proportions of treatment resistant patients participating in them? There are two ways this could happen. First, studies using stronger ADMs could have been more likely to target treatment resistant patients at the outset. Second, the characteristics of patient samples in discontinuation studies may change during treatment due to dropouts caused by the treatment, causing a potential selection bias problem. It is commonly thought that ADM treatment should continue until the index episode resolves, else relapse will recur. For this reason, maintenance ADM therapy is often recommended for 4-12 months or more after the acute management of the index episode (Geddes et al., 2003). Nevertheless, there are troubling empirical problems with these guidelines. For instance, in naturalistic studies, unmedicated patients have much shorter episodes, and better long-term prospects, than medicated patients (Coryell et al., 1995; Goldberg, Privett, Ustun, Simon, & Linden, 1998; Posternak et al., 2006). Several of these studies have found that the average duration of an untreated episode of major depression is 12-13 weeks (Coryell et al., 1995; Posternak et al., 2006). Since acute ADM management of major depression minimally requires several weeks to reduce symptoms, the duration of untreated episodes is much shorter than the recommended duration of ADM therapy. This suggests that ADM therapy may delay resolution of depressive episodes. Drugs that promote the risk of relapse or withdrawal upon discontinuation can cause dependence on the drug to prevent the return of symptoms (Chouinard, 2004). Consequently, such drugs must be managed carefully and patients must provide informed consent for their use (Bursztajn & Brodsky, 1998). ADMs are sometimes prescribed to people with alcohol or illicit drug dependencies (Petrakis, Leslie, & Rosenheck, 2003), because the use of such substances to medicate feelings of anxiety and depression is thought to play a role in the dependency (Tomlinson, Tate, Anderson, McCarthy, & Brown, 2006). Ironically, the use of ADMs to help people wean off such substances might merely replace one dependency with another. Since many patients on antidepressants alone do not achieve full remission (Rush et al., 2006), possibly due to oppositional tolerance, atypical antipsychotic drugs and other agents are increasingly prescribed to enhance the efficacy of ADMs. Our results suggest that the concurrent use of multiple drugs could cause greater monoaminergic perturbations, possibly further increasing the risk of relapse after they are discontinued. I don't have to read any further... it's so obvious when I go back through the years that this is 100% true! I will not be fooled this time! Great study. I hope there will be more like it. I also hope they study the other "weird" stuff going on with some of us... particularly the anxiety and insomnia! The response I got from Dr. Andrews to this e-mail was that he was not aware NONE of these studies contain protocols to distinguish withdrawal symptoms from relapse. This means that withdrawal syndrome was a confounding factor in ALL the studies he and his colleagues analyzed. I am reading Blue again: Perturbational effects of antidepressants suggest monoaminergic homeostasis in major depression. While I find it brilliant, I am wondering if it is yet another study confounded by antidepressant withdrawal syndrome. This is extremely important, as the current thinking about oppositional tolerance and increase in susceptibility to relapse after antidepressant use puts millions of people at risk for chronic, unremitting iatrogenic depression -- while one may (hopefully) recover from antidepressant withdrawal syndrome. Believe me, I find it ironic, to say the least. that antidepressant withdrawal syndrome is a ray of hope in this miasma. My personal interest is that I am in my 7th year of antidepressant withdrawal syndrome, with symptoms quite distinct from relapse of depression. I also run a peer support Web site for people tapering off antidepressants and those suffering from prolonged withdrawal syndrome, http://SurvivingAntidepressants.org. I have long contended that in ALL ADM discontinuation studies, misdiagnosed withdrawal syndrome confounds the findings of relapse, and this undermines the entire body of literature finding new-generation antidepressant efficacy. Not a single discontinuation study of any type reports even one incident of withdrawal syndrome. Surely, in the entire 25-year history of discontinuation studies, it happened once or twice? The studies meeting inclusion in your review examined 3,454 patients. Among these thousands of patients, not one experienced withdrawal rather than relapse? How could that possibly be? "....While the results are robust, their implications depend on their interpretation, so we first discuss several potential confounds. Is it possible, for instance, that the results do not reflect the risk of relapse, but rather withdrawal symptoms? The discontinuation of antidepressant medication can cause withdrawal symptoms (also known as discontinuation syndrome) that are unrelated to relapse, but may sometimes be mistaken for relapse (Haddad, 1997). Such mistakes are more likely with untrained physicians (Haddad, 1997), so it should be less of a problem in ADM discontinuation studies where trained psychiatrists are employed to evaluate putative cases of relapse. Regardless, drugs with longer half-lives are less likely to show discontinuation syndrome (Fava, 2006; Michelson et al., 2000). If discontinuation syndrome were being mistaken for relapse, then drugs with longer half-lives should have lower relapse rates. To test this possibility, we added half-life to the best-fitting model and eliminated the perturbational variables....in fact, half-life was a significant positive predictor of relapse rate. This is because drugs with stronger perturbational effects on 5-HT tend to have longer half-lives. We therefore have no evidence that withdrawal symptoms were mislabeled as relapses...."
The STAR*D study, not included in your review, also run by "trained" psychiatrists, failed to report ANY incidence of relapse among more than 4,000 patients switched on and off drugs. I contend your assumption that expert researchers are less likely to mistake withdrawal for relapse is incorrect. This is indicated by the fact that NONE of these studies, or the STAR*D study, report incidence of withdrawal. Even in the results regarding long half-life medications, it's just as likely withdrawal was mistaken for relapse. The X factor -- human error in diagnosis -- was constant. Peter Haddad and Mauricio Fava themselves probably can't tell withdrawal syndrome from their left elbows, especially if they're diagnosing from a multiple-choice instrument [such as the HAM-D] with no items pertaining to withdrawal. They have a vested interest in denying its existence. Ultimately, however, I agree with your paper's findings: Withdrawal syndrome or not, long-term antidepressant use does more harm than good. There are so many challenges here for how one would "catch" withdrawal... there is no way that a multiple choice questionnaire is going to cut it. Symptoms of anxiety and depression in themselves are so variable from individual to individual. I think about, for example, what led me to suspect that what I've been going through now is not just "regular" anxiety or depression. It is new symptoms never before experienced... but the differences often confound even me. For example, a questionnaire could ask, "do you suffer from anhedonia?" and in both cases, pre-med and now, I would answer yes. And yet, the lack of pleasure and interest I feel now is so much more persistent and pernicious than what I suffered pre-meds. Another example: one of the factors to diagnose you with depression is if you A ) sleep too much or B ) are unable to sleep. Well, for pre-med depressed me, it was the latter. I would just sleep and sleep and sleep to avoid my feelings. I did suffer from insomnia, but it went in cycles and it always involved me having trouble falling asleep, NEVER staying asleep or being able to fall back asleep if something woke me (phone, noise, etc.). Now it's the opposite. I can fall asleep at night but then have trouble staying asleep, and I only seem to be able to sleep 4 to 5 hours max (on good nights). So the question is, if these studies ask you about trouble sleeping, do they correct for CHANGES in "trouble sleeping"? A careful comparison per patient would have to be made. On the other hand, early withdrawal symptoms like nausea, dizziness, brain zaps, etc. are far easier to track and measure. Have you wanted to harm others or yourself? It didn't matter that I went to see her for years, and she knew my exact history and what my issues were. She would just parade the same questions over and over like a machine. It got to the point that I'd start to make jokes. --Have you wanted to harm others or yourself? --Well, occasionally I do feel like murdering the president. --(Complete deadpan face.) If you have feelings of wanting to hurt someone it's important that you call me. --(FFS!!) No, no, I'm kidding. Various of the questions were anorexia/bulimia questions, and it always struck me that she insisted on those so much. She was very overweight and I was very thin, so maybe she thought I had to have an eating disorder and if she kept on asking MAYBE she would just catch me. The only reason I kept on going back was because I had a therapist and I only had to see her once every few months. Other psychiatrists I've had have not been much better (except for the last, but she was way too prescription-happy). They have always had a de facto mistrust in my evaluation of myself. I've found this kind of attitude with most doctors. They treat you like you don't know your own body and are imagining most, if not all, of your symptoms. So given that... and given the real challenges of setting up an experiment that accounts for varied and complex data, it is no wonder that withdrawal, especially extended withdrawal, has been entirely left out. Exactly. Plus, psychiatric diagnosis has always been highly subjective and inaccurate. Do any studies/articles address how the 'rebound depression' (withdrawal) differs from the initial presenting symptomatology? For me, it is dramatically different--worse and unpredictable. I can understand how bipolar is incorrectly diagnosed in many people after using SS/NRIs. I feel like my bottled feelings of 15 yrs are being unmasked (x10) in spurts. I think my taste buds woke up last week. Had a salmon pasta at BJs and it was the 1st I really enjoyed food in years (was one of my main pleasures in life before ADs (can I call that 'BADs'?) I went back for more the next day! Ok, I started reading this article on NCBI and was wondering if Alto had any discussion on it and lo, here it is (after a search). The thing I was most intrigued with was the idea that when the brain pushes to maintain homeostasis in the face of an onslaught of artificial chemicals (ADMs) and those chemicals are withdrawn (as in a precipitous taper or cold turkey) that the brain attempts to compensate to reach homeostasis again and may "overshoot the mark" and the result may be a depression unlike any experienced by the person before. I'll have to do more reading but I am pretty sure that is the right take on it. That explains the statement "this does not feel like my depression" and why the episodes of depression I had during my 2nd year off the drugs and after severe wd hit, were the blackest, deepest, most severe I had ever known. I am trying to put some legs under the things I tell people who are struggling, that there is a reason why they feel the way they do and it is most probably time limited. It was for me, anyway. It is the absence of the meds and not a "relapse". hey this is a bit odd because i have this piece from M Fava and he clearly in 2006 identifies post ssri symptoms as wdl.....in fact his list of wdl symptoms is the most accurate i have seen...so what happened between 2006 and 2010 .... a pharma backhander?...free trip to Hawai or something...because it seems to me he has had a turnaround.... he has lost the plot! Jerrold Rosenbaum and Maurizio Fava, researchers at Massachusetts General Hospital, found that among people getting off antidepressants, anywhere from 20 percent to 80 percent (depending on the drug) suffered what was being called antidepressant withdrawal. "agitation, anxiety, akathisia, panic attacks, irritability, aggressiveness, worsening of mood, dysphoria, crying spells or mood lability, overactivity or hyperactivity, depersonalization, decreased concentration, slowed thinking, confusion and memory/concentration difficulties." To the authors, these symptoms and their widespread recurrence looked increasingly like a drug-related syndrome. Healy has said he saw wdl symptoms for months in healthy volunteers given ssris ....so whats that a return of! Later....just realized something...there are two different Fava's! CW feel free to delete this if you think its off topic ...im still learning how to play the game!! This morning's search for the term 'survivingantidepressants.org Fava' reveals the first 4 results to contain the researcher 'GA Fava's' name on reports reviewed by Alto. Here are my results of a search on this site for 'Maurizio Fava' if you want to read about Alto's dealings with him here. There were more than just the 2 google found above, don't know why. I'll leave your post as is, though it wipes out something I was hoping those currently struggling with the vagaries of the mental aspect of wd might see and take heart. I think I will just copy it to my thread instead. ...Andrews et al take the view of evolutionary psychiatry: The brain adapts and re-adapts, maintaining homeostasis as it was intended to do. Excellent work again, Alto. Good summary. And doesn't it seem so obvious? Homeostasis is one of the central concepts of biology, whether we are talking about a single cell organism or something as complex as the human body. Homeostasis was emphasized heavily when I took biology, even in grade school. I think this occurs with all drugs, not just SSRIs. I think that in the case of SSRIs, it's pretty frickin hard to overcome 80% occupation of the serotonin transporter, and a lot of adaptations that occur are very imperfect and don't reestablish homeostasis. I also don't like some authors preoccupation with changes in monoaminergic neurotransmission. If only it were that easy, we could manipulate serotonin levels and presto withdrawal would be gone. Of course these adaptations go far deeper than that. SSRI antidepressants have been shown to cause long-term alterations in gene expression, presumably resulting from chronic elevation of serotonin (5-HT) neurotransmission in the brain. For example, chronic treatment with ﬂuoxetine (Prozac) has been shown to cause persistent desensitization of 5HT1A receptors even after removal of the SSRI. These long-term adaptive changes in 5-HT receptors, as well as more complex, global changes, are likely to be mediated through alterations of gene expression. Some of these gene expression changes are a result of altered DNA structure caused by chromatin remodeling, speciﬁcally epigenetic modiﬁcation of histones and gene silencing by DNA methylation due to increased expression of the methyl binding proteins MeCP2 and MBD1. That was taken from the full text of this article. The risk of relapse after ADM discontinuation was higher than the risk of relapse after remission on placebo. Can anyone explain what an alteration in gene expression is? What is "gene expression," anyway? "SSRI antidepressants have been shown to cause long-term alterations in gene expression,"
Edit Two: I am still not sure I know what it means in the case of psych drugs...do they cause our genes to make the wrong proteins, wrong amounts, or??? I guess I'll read the original post again! When any of these studies discusses "relapse" after discontinuation, they have rolled withdrawal syndrome into "relapse." Almost none of the studies on antidepressant discontinuation included any protocols to identify withdrawal symptoms. The subjects were all given depression questionnaires to rate their symptoms. Consequently, the statistics on relapse on antidepressants are all, without exception, confounded by misdiagnosed withdrawal syndrome. It's very possible -- even likely, given the slim margins of significance in these studies -- that, if the withdrawal syndrome were subtracted, there is no significantly different rate of relapse after antidepressant discontinuation. I have downloaded and read Andrews et al 'Blue Again' (and a number of other scholarly articles) carefully. I will be discussing some of the authors' findings with my wonderful Psychiatrist when I see her next week. 1. What exactly does 'overshoot' or 'overcompensate' mean in the context of oppositional tolerance following discontinuation of ADMs? I understand the coiled spring metaphor, but in neurochemical terms does it mean that the body/brain/gut ( whatever) produces an excess (or deficit) of monoamines to compensate for the ADM perturbations? 2. It seems that while Andrew's methodology takes certain variables into account, the studies relied upon do not fully take treatment duration (assumed treatment period of 10 weeks) and dosage (no data...a missing value that perhaps should have been imputed) ) of ADMs into account. Surely, for example, a 56 kg woman will have a different dosage tolerance threshold to a 110 kg man? Similarly, A person who has been on ADMs for 20 years may have different neurological remodelling than a person on ADMs for 3-6 months? It seems to me that in the human studies relied upon, generalisations in relation to 'relapse' and/or recurrence have been drawn from a disparate cohort of subjects...While I don't condone experimentation on animals (the image of depressed rodents struggling in a vat of water, aka 'uncontrollable shock' is itself shocking to me! ), variability among lab rats is liable to be less pronounced than that among human subjects in drug-placebo trials. Further, while the degree to which ADMs perturbed 5-HT and NE levels in rats was measurable, that in humans was not. 3. In his discussion of depressive relapse and stringency criteria, Andrews et al seem to depart from their adaptive framework. If one regards depression as a 'normal' adaptive response to stressors, as Andrews et al seem to, surely individual environmental triggers and stressors would need to be factored into any discussion of relapse and/or recurrence following ADM discontinuation? Also, that the paper, as you point out, is largely silent on the distinction b/w withdrawal symptoms and relapse/recurrence is also a concern. While the authors acknowledge that the implications of their results 'depend on their interpretation' ( p 12) and that withdrawal symptoms may be 'mistaken for relapse' , they do not explore the issue further other than to suggest that trained psychiatrists are somehow equipped to tell the difference (and pigs might fly). 4. While the paper concludes ( p 14) that 'prolonged ADM use triggers oppositional tolerance' etc. I am unable to find any data in the paper which defines 'prolonged'. Am I missing something? I think this is a significant issue, esp for those of us who were initial 'test subjects' (lab rats?) back in the early 1990's when SSRIs first hit the market and have been struggling with the neurological consequences of ADM use ever since. Any comments or insights welcome! 1. 'Overshoot' or 'overcompensate' in Andrews's context means activity in all neurohormonal systems, particularly the excitatory or activating functions that had been repressed by the drug. 2. No psychiatric drug withdrawal studies take into account weight or length of time for exposure. They may identify subjects by gender and age. 4. Please write Paul Andrews for his definition of "prolonged" and let us know what he says. Based on the results of the study, it looks like Zoloft (sertraline) is one of the hardest to get off of, if you look at the table and the part in the results that says 5HT perturbation is proportional to likelihood of "relapse". It looks like its worse than Paxil! Am I reading that right? Is Zoloft being tough to quit concurrent with the experience of those on this site? My guess is that paroxetine is the most difficult SSRI to go off. 5-HT perturbation may not be the entire determinant for withdrawal difficulty. It's also possible that the differences in "perturbational" effects between sertaline and paroxetine are not significant when it comes to comparing withdrawal difficulties. This all make me sick!